According to news articles, JMA reported Surtseyan explosions from Fukutoku-Okanoba, 5 km NE of the island of Minami-Iwo-jima, on 3 February. Steam-and-ash plumes rose 100 m a.s.l. and the surrounding sea turned yellow-green. Video footage of the event was captured by people aboard a Japanese Coast Guard patrol boat. One article stated that the sea in the area had regularly changed colors since the 1950s, most recently in December 2009. An explosion above the water surface from the submarine Fukutoku-Oka-no-Ba volcano was observed by the Japanese Coast Guard on 3 February 2010, and eruption alerts continued into early April of that year (BGVN 35:02). Although intermittent plumes of water discoloration after that indicated some level of ongoing activity through April 2014, the last observation of pumice on the sea surface was on 14 April 2010. This trachyandesitic volcano is located 5 km NE of the Japanese island of Minami-Ioto, about 1,275 km S of Tokyo in the Izu-Bonin arc (figures 11 and 12). The National Catalogue of the Active Volcanoes of Japan, monthly reports by the Japan Meteorological Agency (JMA), and information tables and photographs prepared by the Japan Coast Guard (JCG) and Japan Maritime Self Defense Force (JMSDF) were the data sources for this report. A summary of the observations recorded during site visits made by Japanese authorities between April 2010 and October 2015 is given here, and additional details are provided in the table at the end of the report (table 3). Figure 11. Submarine topographic map of the Fukutoku-Oka-no-Ba area. Image date not provided but it appears to pre-date the February 2010 explosion. The island above sea level at bottom is Minami-Ioto. Fukutoku-Oka-no-Ba is 5 km N and slightly E. The NW-SE elongate submarine volcano is Kita-Fukutokutai; the Kaijin Knoll is the northernmost edifice. Courtesy of Japan Coast Guard (from National Catalogue of the Active Volcanoes in Japan). Figure 12. Submarine topographic map of Fukutoku-Oka-no-Ba after the February 2010 eruption (specific date not provided). Courtesy of Japan Coast Guard (from National Catalogue of the Active Volcanoes in Japan). Observations from February 2010 through April 2011. On 3 February 2010, a 100-m-high ash and steam eruption emerged from the sea. Floating pumice was later observed on 14 April 2010 (referred to as "floating objects" in the translation of JMA and JCG tables). Discolored water continued to be observed around the volcano for the rest of 2010. Activity from multiple vents created blue-white, milky-white, and greenish-brown plumes of discolored seawater a few hundred meters wide that drifted as far as 2,700 m. In January 2011, blue-white and creamy-colored water plumes from multiple vents drifted NE in a fan shape approximately 500 m across (figure 13). Discolored water plumes were also observed on 8 February and 12 April 2011. Figure 13. Blue-white and greenish brown discolored seawater at Fukutoku-Oka-no-Ba on 19 January 2011. The source appears to be from multiple vents. The fan shape extends about 500 m NE of the vent source. Minami-Ioto is at the upper left. Courtesy of JMSDF (Japan Maritime Self Defense Force). Observations from January 2012 through August 2012. Inspections of the volcano in May, July, August, and November 2011 revealed no discolored water plumes or floating objects at the site. A 150-m-diameter plume was visible again on 27 January 2012. Observations on 9 March and 19 April 2012 confirmed the continued presence of discolored water. On 11 May 2012, a 50 x 150 m milky-green-colored area was photographed by the JCG (figure 14). Additional observations of discolored water plumes were made on 13 June, 15 June, and 9 August 2012; no visits were made during September-November 2012. Figure 14. Milky-green discoloration of seawater at Fukutoku-Oka-no-Ba on 11 May 2012. The dimensions of the greenish plume are about 50 x 150 m. Courtesy of TRCGH (Third Regional Coast Guard Headquarters, JCG). Observations between December 2012 and April 2014. Green water was originating from multiple locations within a 1,000-m-diameter plume on 11 December 2012. Milky-white, bluish-white, and yellow-brown discoloration of seawater from multiple sources was again observed on 22 January 2013 (figure 15). Figure 15. Milky-white and bluish-white discoloration of seawater from multiple vents on 22 January 2013 at Fukutoku-Oka-no-Ba. Courtesy of TRCGH (JCG); color adjusted. Plumes were observed twice in March (8 and 26), April (10 and 21), and on 12 May of 2013 but not during visits in June and July. They were seen again on 21 August and 27 September. No visits were made in October and November, but a 1,850-m-long plume drifting E was observed on 16 December 2013 by JMSDF. The last confirmed observations of discolored water plumes were on 29 January and 28 April 2014 by the JMSDF and JCG. They continued to visit the site nearly every month until October 2015, with no further observations of discolored water plumes. No further reports were made after October. Table 3. Summary of observations made at Fukutoku-Oka-no-Ba between March 2010 and April 2014 by Japanese authorities. The Japan Coast Guard continued to visit the site almost every month through October 2015 with no further reports of water discoloration, and it was not mentioned after that date in monthly JMA reports. Sources: JMA*= National Catalogue of the Active Volcanoes in Japan, JMA= Monthly Summary Report, Japan Meteorological Agency, JMSDF= Japan Maritime Self Defense Force, TRCGH= Third Regional Coast Guard Headquarters, JCG=Japan Coast Guard. Reference. Japan Meteorological Agency, 2013, National Catalogue of the Active Volcanoes in Japan (Fourth Edition, English Version), Tokyo, Japan (http://www.data.jma.go.jp/svd/vois/data/tokyo/STOCK/souran_eng/menu.htm). Information Contacts: Japan Meteorological Agency (JMA), Otemachi, 1-3-4, Chiyoda-ku Tokyo 100-8122, Japan (URL: http://www.jma.go.jp/); Japan Coast Guard (JCG) Volcano Database, Hydrographic and Oceanographic Department, 3-1-1, Kasumigaseki, Chiyoda-ku, Tokyo 100-8932, Japan (URL: http://www1.kaiho.mlit.go.jp/GIJUTSUKOKUSAI/kaiikiDB/kaiyo24-2.htm). On the evening of 2 July, members of the Japan Coast Guard observed a steam plume rising ~1 km above the sea near the island of Minami-Iwo-jima. On 3 July, JMA confirmed that a small-scale eruption had occurred at the submarine volcano Fukutoku-Okanoba, prompting the Japan Coast Guard to issue a warning against sailing in the area. Observers saw rock and mud rising to the sea's surface near the volcano and a ~1-square-km area of water that had turned orange-brown. As of 4 July, a new island had not formed. The following cable was received from Fleet Weather Central, Guam. "On 25 March 1975 a U.S. Air Force reconnaissance flight operating out of Guam sighted an area of oceanic volcanic activity 32 km S of Iwo Jima. The sighting was described as possibly an island in the formative stages. Photographs were taken by the crew. Fleet Weather Central, Guam, is closely watching weather satellite coverage for the area for any signs of further activity." Information Contacts: Fleet Weather Central, U.S. Air Force, Guam, Mariana Islands. [A report of surface discoloration in March was removed at JMA's request.] The last reported activity in this area was a [green] discoloration in August 1976. Sea surface discoloration was observed from the air on 1, [12, 13, 16, 17, 21, 22, and 25 May]. Discoloration was observed on 14 October 1977, 15 and 25 November 1977, 8 and 23 December 1977, and 10, 24, and 25 January 1978. Aerial reconnaissance by the JMSA in late January showed slight discoloration of the ocean around this volcano, at 24.30°N, 141.48°E. Information Contacts: Y. Sawada, Meteorolgical Research Institute, Tokyo; D. Shackelford, CA. Figure 1. Map showing Japan and the Volcano Island chain. Volcanoes active in 1978 or 1979 are indicated by black squares. Courtesy of JMA. JMSA [and JMSDF have] continued frequent monitoring flights over several known submarine volcanoes (table 1). On almost all overflights discolored sea water was seen around Fukutoku-Okanoba, the most active submarine volcano in this area. Table 1. Volcanic activity at three sites (Fukutoku-Okanoba, Minami-Hiyoshi, and Fukujin) in the Volcano Islands, January 1978-December 1982, detected by JMSA and JMSDF monitoring flights. Activity indicated as D = Discolored water; N = No discolored water, - = No overflight, ? = not reported. This table combines data from reports in 1979 (4:7), 1980 (5:4, 5:11, and 5:12), 1981 (6:10), and 1982 (7:9, plus additional data not published in the Bulletin). A milky white discoloration, about 100 m in diameter, was observed on 17 September and discoloration was noted again on 17 October. JMSA has continued frequent aerial monitoring of several known submarine volcanoes. Volcanic activity has often been observed at Fukutoku-Okanoba during overflights since late 1983 . . . . Discolored water was observed at Fukutoku-Okanoba on: 21 December 1983; 30 January, 23 February, 15 March, 6 and 23 April, 18 May, 9 June, 10 July, 1 August, 6 September, and 16 November 1984; and 14 February, 15 March, 17 April, 14 May, 17 September, and 17 October 1985; and was not visible 26 September, 24 October, and 12 December 1984. On 18 January, fishermen observed a large white plume rising to more than 3 km altitude and lava being ejected to about 300 m height form the vicinity of the submarine volcano Fukutoku-Okanoba. The eruption was first evident on infrared imagery from the Japanese GMS geostationary weather satellite on 18 January at 2100. Japan Maritime Self-Defense Force personnel stationed on Iwo-Jima, about 50 km from Fukutoku-Okanoba, observed a 4-km eruption cloud the next day at 1630. The Japan Maritime Safety Agency's survey ship Takuyo found a new island about 5 km NE of Minami Iwo Jima (south Iwo Jima) the morning of 21 January. The new island, about 700 m long and 300 m wide, extended about 15 m above sea level. Lava was being ejected to about 300 m height. As of 21 January, floating pumice had drifted 60 km to the SE. An eruption . . . built a small island in mid-January. Only milky blue discolored sea water was observed near the volcano on 16 January at about 1200. By 18 January at 2000, eruptive activity was frequent, producing a dark plume, seen from a fishing boat, that reached 3,000-4,000 m height. An hour later the plume was evident on an image from Japan's GMS satellite. The next day at about 1630, airborne radar detected a plume rising to 4,000 m above sea level. On 20 January at 0440, radar on the JMSA's survey ship RV Takuyo showed an island-like image. A gray plume rose to 2,000 m altitude at 0550. A new island was recognized by observers on the RV Takuyo at 0630. A 50-m vent at the NW edge of the new island ejected plumes and sea water. Continuous observations were made until about 1000. The island was ~700 m long, 500 m wide, and 15 m high (figure 2). A vent near its E edge remained below sea level, ejecting black incandescent rocks as much as 10 m in diameter. Grayish brown pumice had drifted as much as 18 km NE from the vent. Discolored sea water surrounded the island and extended 22 km NE from the vent. The sea water was greenish near the island, gradually becoming greenish yellow or pale blue farther from the vent. Figure 2. Sketch maps of the new island and associated vent and plume at Fukutoku-Okanoba, 20-23 January 1986. Courtesy of JMA. At 1122 a dark plume containing incandescent rocks to 10 m in diameter rose 1,200-1,300 m above sea level; between 1250 and 1400 a vapor plume rose to 3,000 m. There was a zone of discolored water ~45 km long and 2-3 km wide. Between 1450 and 1550, explosions occurred at about 20-minute intervals, expelling dark plumes that rose ~1,200-1,700 m. Between 1600 and sunset, 90 weak to moderate explosions ejected plumes to 100-1,000 m height. Volcanic flame was occasionally seen within dark plumes at night. The next morning at 0800 explosions produced small plumes (less than 50 m high) at intervals of 1-2 minutes. At 1223, a large explosion was seen; volcanic flame reached 1,500 m above sea level, roughly half of the plume's height. At 1300 the island was flat and crescent-shaped, covered with ash and pumice but no lava flow. The outer arc of the crescent was a portion of a circle ~700 m in diameter having a center that roughly coincided with the position of the active vent, which was ~300 m in diameter (figures 3 and 4). An area of thin yellow or green discoloration extended SSE to 2 km from the island. Pumice drifted E and S.
Figure 3. Photograph of the new island and eruption plume at Fukutoku-Okanoba on 21 January 1986 at about 1400. The conical island in the right background is Minami-Iwo-jima. Photo by G. Iwashita, JMA. Figure 4. Photograph of the new island and eruption plume at Fukutoku-Okanoba on 21 January 1986 at about 1600. Photo by G. Iwashita, JMA. By the morning of the 22nd explosive activity had subsided; no plumes were seen for the rest of the month. Erosion of the shoreline of the new island was evident early the next day. However, at 1300 outflow of discolored sea water suggested that the submarine vent, 80 m in diameter, was still active ~400 m E of the island. The island, covered with gray ash, was ~500 m in length and had a maximum width of 200 m. During the morning of 25 January, dense blue discoloration was seen around and E of the island and had drifted somewhat eastward, to ~9 km from the vent. On the 29th the island's size was estimated at ~600 m long, ~400 m wide and ~10 m high (this preliminary estimate does not necessarily indicate growth since the 23rd). Yellowish green discoloration extended as much as 38 km to the NE, and brown pumice was floating in lines near the island. Between 20 December and 20 January, nearly 100 T-phase waves of moderate intensity were received by high-gain seismic stations at Rangiroa, Tuamoto Islands (~9,000 km SE of Fukutoku-Okanoba). J.M. Talandier noted that T-phase waves are characteristic of submarine eruptions, having shallow (ocean) depth. The origin of these waves was in the NW Pacific, and they may be related to the eruption of Fukutoku-Okanoba. Discolored water has frequently been observed around Fukutoku-Okanoba in recent years. In an interview on a Japan Broadcasting Network newscast, Professor Kosaka of Okayama Univ reported that about 8 years ago a sonar survey from the Tokyo Fisheries Univ ship Seio-maru detected a seamount with a summit 40 m below sea level and roughly 150 m wide, beneath the discolored water zone at Fukutoku-Okanoba. Small islands were formed during the 1904-1905 and 1914 eruptions, but did not persist after 1905 and 1916. An island was reported during an eruption on 24 December 1974, but was not visible the next day. Information Contacts: JMA; J. Talandier, Laboratoire de Geophysique, Tahiti; NHK Japan Broadcasting Corporation, Tokyo. The island formed 20 January . . . has been eroded away by wave action since volcanic activity ceased. The island's disappearance was reported by the JMSDF after an hour-long helicopter flight that began 8 March at 0745. The surface of the new edifice was seen under white water, and there was no sign of a volcanic plume. On 28 January, airplane pilots observed light brown floating pumice within a roughly rectangular NW-SE-trending zone ~200 km long by 50 km wide, extending from ~100 to 300 km SE of the volcano. The pumice was in subparallel teardrop-shaped rafts roughly 4 km wide and 10 km long, elongate perpendicular to the apparent direction of drift. Rocks collected from Fukutoku-Okanoba after previous eruptions in 1904, 1914, and 1982 were trachyandesites with high alkali contents. Information Contacts: M. Matson, NOAA/NESDIS; Kyodo Radio, Tokyo; UPI. Water discoloration was seen on every overflight in February and March. Wave action gradually eroded the island built by the January eruption, and JMSA personnel reported that it was entirely below sea level by the time of their overflight on 26 March. Airplane pilots have observed discolored water at the volcano during all overflights after the temporary island was eroded below sea level in late March. No eruptive activity was reported. The length of the zone of discolored sea water was 0.3 km on 16 April, 2 km on 19 May, and 25 km on 18 June. On 14 July at about 1240, discolored and spouting seawater was reported by observers on a fishing boat. Sprays reached 10 m above the water surface for about a minute at intervals of 10-15 minutes. The next day, 100-150-m-diameter, circular, white-crested waves with spouts in their centers formed at intervals of 6 minutes throughout a 50-minute JMSA overflight. 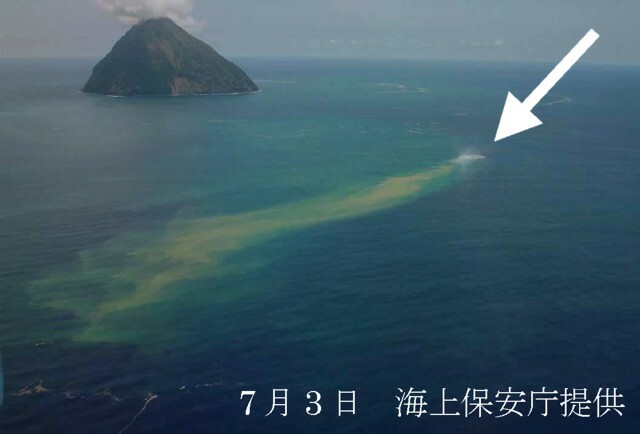 Some floating pumice was found within a zone of yellowish-green seawater that was 500 m wide and stretched 18 km E. No white-crested waves formed after 16 July. During a 17 July overflight, a 30-100 m-wide area of green seawater extended 13 km E. Pumice floated at the E end of this area. On 21 July discolored seawater spread out from two points and minor amounts of pumice were floating in the area. On 30 July deep-green discolored water extended as far as 9 km E over an area 0.5-2 km wide and contained floating brown pumice. Discolored seawater continued to be seen in August by the JMSA. On 1 August, a zone of yellow-green seawater stretched 3 km NW-SE. The next day water over the vent was discolored green. Discolored water was next reported on 13 August, when cobalt-blue water covered an area of 0.01 x 4 km along an E-W axis. On 17 August the discolored area was 3 km in diameter, and spouting seawater was seen twice. No floating pumice was observed. Information Contacts: Y. Sawada, JMA; D. Shackelford, Fullerton, CA. JMSA observed pale green discolored water above the volcano on 17 September. JMSA observed sea discolorations on 12 August in an area of 0.09 x 0.9 km and on 15 September in a zone of 0.05 km (N-S) by 1.8 km (E-W). Thermal activity has continued since the January 1986 eruption (11:1-3). A pale green belt of discolored sea water and white bubbles was observed during a JMSA overflight on 9 May 1989. Another monitoring flight, on 14 June, revealed a 50 x 400 m zone near the vent that was discolored cobalt blue. Information Contacts: JMA; D. Shackelford, Fullerton, CA. Aerial observations of the ocean surface above the submarine volcano revealed discolored water in January-May, September, and November (table 2). The longest discoloration, 8 km, was observed during an overflight on 17 January. Thermal activity has continued since the January 1986 eruption . . . . Discolored water has been frequently observed since that time (14:07). No discolorations were observed at other submarine volcanoes (Kaitoku, Minami-Hiyoshi, Nikko, and Fukujin seamounts) during 1990. Table 2. Discolored water at Fukutoku-Okanoba, observed from monthly overflights in 1990. Courtesy of JMSA. A blue water discoloration, extending 2 km E-W, was observed during a 6 February overflight by the JMSA. Overflights on 18 January, 12 March, 15 April, and 10 May revealed no abnormal water. A greenish water discoloration was observed during a 30 September overflight by the JMSA. No discoloration was present during a similar overflight on 21 August. An 18 October overflight by the JMSA revealed discolored green water over the submarine volcano. A dark plume was observed [in the air above Fukutoku-Okanoba] by fishing crews at about 0800 on 10 November. An overflight by the JMSA from 1315 to 1350 revealed discolored pale-green water in a narrow fan shape to 10 km NNW from the volcano. Brown pumice was seen but no ejections were observed at that time. An overflight on 12 November between 1215 and 1250 revealed that water discoloration was reduced to a zone extending 1 km NW without floating pumice, indicating a decrease in activity. An area of discolored water 2 km long was seen in August but no discoloration was observed during the last overflight before the eruption, on 22 October. Overflights by the JMSA on 12 and 18 November revealed a smaller and weaker area of discolored water over the submarine volcano than on 10 November. The height and size of the dark plume seen by fishermen on 10 November are not known, nor is is known whether the plume contained tephra. Floating pumice was observed that day, but none has been reported since then. Discolored seawater over an area a few hundred meters wide was seen during monthly aerial observations . . . in February, March, June, and September 1993. An aviator flying over the waters of the southern Volcano Islands for Japan's Maritime Safety Agency reported seeing light-green seawater on 25, 27, and 28 November. Discolored seawater was last seen at this location in September 1993. On 12, 22, and 23 January, an aviator from the Japan Marine Safety Agency (JMSA) reported distinct discoloration of seawater to yellowish green. Similar discoloration was seen during 25-28 November 1995 (BGVN 20:11/12). Prior to that, discolored seawater was last seen at this location in September 1993. Aviators from the Japan Marine Safety Agency (JMSA) began observing yellowish-green discoloration of seawater during 25-28 November 1995 (BGVN 20:11/12). Similar discoloration was seen on 12, 22, and 23 January 1996 (BGVN 21:01), and also on 26 January, as reported by the Japan Meteorological Agency. Information from the Volcano Research Center revealed that JMSA observers once again noted yellowish brown discolored seawater in the area on 4 April. According to the reports, the colored area expanded like a belt up to ~3 km long. Strong emission of colored water was recognized from two points. Although white-colored suspension was observed on the surface, floating pumices were not recognized. Yellowish-green to yellowish-brown water observed on 12 April formed a plume ~4 km long and 200 m wide, including 3-4 spots from which colored-water was gushing out intermittently. No pumices were recognized. Information Contacts: Volcanological Division, Seismological and Volcanological Department, Japan Meteorological Agency (JMA), 1-3-4 Ote-machi, Chiyoda-ku, Tokyo 100 Japan; Volcano Research Center, Earthquake Research Institute, University of Tokyo, Yayoi 1-1-1, Bunkyo-ku, Tokyo 113, Japan (URL: http://www.eri.u-tokyo.ac.jp/VRC/index_E.html); Hydrographic Department, Maritime Safety Agency, 3-1 Tsukiji, 5-Chome, Chuo-ku, Tokyo 104, Japan. On 4 April, an aviator from the Japan Marine Safety Agency reported discoloration of seawater to yellowish brown at Fukutoku-Okanoba (BGVN 21:03). On 6 and 7 April, similar discoloration was observed by an aviator of the Maritime Defense Force. More discoloration was reported on 12 and 30 April. No floating pumice was observed. Discolored seawater has been seen on a smaller scale at this location, since 24 November 1995 (BGVN 20:11/12). During the first half of May, aviators of the Maritime Safety Agency and the Maritime Self-Defense Force reported discoloration of seawater at Fukutoku-Okanoba. Similar discoloration has been observed since November 1995 (BGVN 20:11/12, 21:01, 21:03, and 21:04). An overflight on 23 May indicated no discolored seawater. On 6 September, a Japan Maritime Safety Agency aviator reported yellow-green (in part yellowish brown) discoloration of seawater at Fukutoku-Okanoba over an area of 50 x 150 m, and to light green over a 300 x 500 m area. On 18 September green discoloration was seen by an aviator of the Japan Maritime Self-Defense Force. Smaller areas of discolored seawater have been seen at this location since 24 November 1995 (BGVN 20:11/12, v. 21, nos.1 and 3-5). On 12 December, a Japan Maritime Safety Agency aviator reported yellow-green discoloration of seawater at Fukutoku-Okanoba over a 50 x 200 m area. On 27 January, pale green discoloration was seen by an aviator of the Japan Maritime Safety Agency covering an area of 2,000 x 100 m.
Notice of Fukutoku-Okanoba unrest in 2005 first came to Bulletin editors from Olivier Hyvernaud, information that was amplified by the Japanese Meteorological Agency (JMA) Volcanic Activity Reports of July and October 2005. The JMA reports contain information from the Japanese Marine Defense Forces as well as the Marine Security and Safety Agency and the Tokyo Institute of Technology. In addition, a Japan Coast Guard website (see URL below) contains a more extensive (and yet untranslated) table on recent events at Fukutoku-Okanoba, which includes photos and videos of the July eruption. That table clearly illustrates activity both earlier and later than the 2-3 July eruption, and several other details not discussed here, including the observation of numerous large and steaming blocks floating on the ocean surface at mid-day on 3 July. Bulletin editors hope to decipher this table and include more details in a later report. The last five Bulletin reports discussing or mentioning Fukutoku-Okanoba appeared in BGVN 22:01, 24:11, 24:12, 25:05, and 28:06 (1997-2003). Note that the last four cases were considered ambiguous and grouped along with reports under the heading "Acoustic signals in 1999-2000 from unknown source, Volcano Islands, Japan" and only the first case was listed under the volcano name). A 3-d view of the volcano and its setting appears as figure 5. Figure 5. Fukutoku-Okanoba and vicinity shown in a 3-dimensional diagram, with shading (or color) representing various elevation ranges (see key above); vertical exaggeration is considerable but was not stated. The inset contains an index map showing the Volcano islands along the Bonin trench. The diagram represents data from 1999 and views the region from the SE. Fukutoku-Okanoba is a submarine vent ~ 5 km N of the island (Minami-Iwo-jima). Copyrighted image courtesy of the Japan Coast Guard. JMA reported that at about 1745 on 2 July 2005, a white plume was witnessed at Fukutoku-Okanoba. During an investigation at 1900 that same day, a white plume reached ~ 1 km above the sea surface. A photo taken from considerable distance was included in the JMA report, showing the plume, but the image's limited contrast has led to its exclusion here. In addition to the plume, other evidence for an eruption included debris on the sea surface. When seen on 2 July, the debris covered an area approximately 100 m wide and 300 m long. JMA noted that 3 July aerial observations suggested that compared to the previous day, eruptive vigor and the height of the white plume had decreased. The key observation then was a zone of discolored seawater (figure 6). Figure 6. An aerial view of Fukutoku-Okanoba taken on 3 July 2005 as seen from the NE. Debris and discoloration extend from the arrow. Courtesy of the Maritime Security and Safety Agency. JMA's report of 4 and 5 July aerial investigations noted the lack of a white vapor plume over the sea. In other words, the 2-3 July eruption had calmed, but fresh debris and seawater discoloration were still present. After that, aerial investigations on 15, 17, 20, and 21 July, again disclosed seawater discoloration, but not the presence of floating debris. 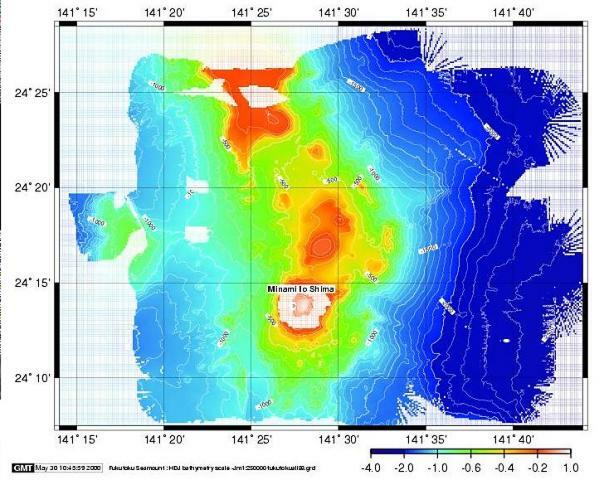 The Maritime Security and Safety Agency conducted an underwater topographical survey on 20-22 July 2005, the result of which was the discovery of two craters caused by the recent eruption. The results suggested that the topography just S of those craters was newly raised. According to a 3 October aerial observer, the ocean surface near Fukutoku-Okanoba, then displayed a pale, blue-white discoloration, interpreted as indicative of volcanism. The area of discoloration extended ~ 300 m in length to the E and was ~ 50 m wide (N-S) at its widest point. However, in the surrounding area they saw no floating debris or plumes containing ash or steam. On 27 October, an aerial observation could not confirm the seawater discoloration. Satellite data. M. Urai (2005) reported that three days after the 2 July 2005 eruption of Fukutoku-Okanoba, satellite remote sensing using ASTER (Advanced Spaceborne Thermal Emission and Reflection Radiometer) observed the discolored seawater and floating materials within 40 km of the submarine volcano. Some of this abstract follows. "At the most dense discolored seawater area, reflectance of ASTER band 1 is 3% higher [than] the surrounding seawater. The floating materials are similar in ASTER VNIR [Very Near-Infrared Radiometer] reflectance spectra to clouds, however, the floating materials can be separated from clouds using their shape and stereo image features. The extensions of discolored seawater area and floating material detected by ASTER were 6.34 km2 and 1.14 km2, respectively. It is possible to estimate the scale of [a] submarine eruption using the quantitative data derived from satellite remote sensing." Distant hydrophones. Robert Dziak and Haru Matsumoto monitor N Pacific volcano seismicity with the National Oceanic and Atmospheric Agency/Pacific Marine Environmental Laboratory (NOAA/PMEL). They initially learned of the eruption via the internet. Regarding the 2 July eruption, Dziak wrote to the Bulletin staff on 22 November 2005. Some of his messages follow. ". . . the [N] Pacific hydrophone array we use recorded seismicity during the Fukutoku-Okanoba eruption near Iwo Jima. I was aware of the eruption at the time [mid 2005] thanks to Haru [Matsumoto; he designed and built the instruments used there to record the T-wave events] forwarding a news image of the discolored water. Despite being only able to roughly locate the seismicity since it is way west of our array, I am pretty sure Fukutoku-Okanoba was the source because the arrival azimuths and timing of the signals were a match. The last earthquake activity we recorded from this area occurred on 25 September  . . .. A few years ago I was contacting you [Smithsonian Institution] about our recording of harmonic tremor from a source in the Volcano Islands. The conclusion I published in JGR [Dziak and Fox, 2002] was that either Fukutoku-Okanoba or Funka-asane ([N] of Iwo Jima) was the probable source because of a history of submarine volcanic activity at both volcanoes. We have still been recording this tremor intermittently over the last few years and another pulse of it occurred during the Fukutoku-Okanoba eruption on July 2, 2005. The last occurrence was on August 22. According to an Email from Dziak on 23 November 2005, "...I think the tremor is coming from [Fukutoku-Okanoba or Funka-asane]. I was only able to get synchronous data from the French Polynesian seismic net (Hyvernaud). They confirmed the signals but it did not help much with location because they were so far away. My thought is the source of earthquakes and tremor from these submarine volcanoes is at an ocean depth within the sound channel. This allows for very efficient seismic-acoustic coupling and acoustic propagation throughout the Pacific ocean basin." References. Dziak, R.P., and Fox, C.G., 2002, Evidence of harmonic tremor from a submarine volcano detected across the Pacific Ocean basin: Journal of Geophysical Research, v. 107(B5), p. 2085; doi 10.1029/2001JB0001772085. Kato, Y., 1988, Gray pumices drifted from Fukutoku-oka-no-ba to the Ryukyu Islands: Bulletin of the Volcanological Society of Japan, Second Series, v. 33, p. 21-30. Ossaka, J., Mitsuno, C., Shibata, T., Matsuda, T., Hirabayashi, J., Tsuchide, M., Sakurai, M., and Sato, H., 1986, The 1986 submarine eruption of Fukutoku-okanoba, Part 2. Volcanic ejectas: Bull. Vol. Soc. Japan, v. 31, p. 134-135. Urai, M., 2005, Monitoring submarine volcano with satellite remote sensing: Eos Trans, AGU, v. 86(52), Fall Meet. Suppl., Abstract 611A-1176. Information Contacts: Olivier Hyvernaud, Laboratoire de Géophysique, BP 640 Pamatai, Tahiti, French Polynesia; Japanese Meteorological Agency (URL: http://www.jma.go.jp/JMA_HP/jma/indexe.html); Robert Dziak and Haru Matsumoto, NOAA PMEL, Hatfield Marine Science Center, 2115 SE Oregon State University Drive, Newport, OR 97365, USA; Yukio Hayakawa (URL: http://www.hayakawayukio.jp/English.html/); Daily Yomiuri News (URL: http://www.yomiuri.co.jp/); Reuters; Associated Press; Tokyo Institute of Technology, 2-12-1 O-Okayama, Meguro-ku, Tokyo 152-8551, Japan; Japan Coast Guard, Hydrographic and Oceanographic Department (URL: http://www1.kaiho.mlit.go.jp/GIJUTSUKOKUSAI/kaiikiDB/kaiyo24-2.htm); Japan Maritime Security and Safety Agency, Oceanic Information Section (URL: http://www1.kaiho.mlit.go.jp/). 1) Discolored water with submarine volcanic activity reported within 1,700 m of 24°17.5' N, 141°29.4 E at 0400 UTC on 4 October 2006 [ref. Notice to Mariners, 14 October 2006 (no. 41), HYDROPAC Warning 1921/06(97) North Pacific, issued 1009 UTC on 4 October 2006]. For the locations given for warnings 1 and 2, the respective deviations from coincidence with Fukutoku-Okanoba (at the coordinates given above) are 1.4 and 0.8 km. That seamount frequently produces discolored seawater and is known to erupt on occasions as well, and is thus the probable source for the discolored water. According to the Japan Meteorological Agency, observations on 15 November 2006 by the Japan Maritime Self Defense Force and aerial observations on 21 November 2006 by the Japan Coast Guard revealed areas of discolored water on the sea surface above the volcano. Those cases seemed to be caused by volcanic activities. Information Contacts: Olivier Hyvernaud, Laboratoire de Géophysique, BP 640 Pamatai, Tahiti, French Polynesia; Notice to Mariners, National Geospatial-Intelligence Agency, National Ocean Service, and U.S. Coast Guard, Office of Corporate Relations, Public Affairs Division, MS D-54, 4600 Sangamore Road, Bethesda, MD 20816-5003, USA (URL: http://www.nga.mil/portal/site/maritime/); Japan Meteorological Agency, 1-3-4 Otemachi, Chiyoda-ku, Tokyo 100-8122, Japan (URL: http://www.jma.go.jp/). The submarine volcano Fukutoku-Okanoba, frequently the source of discolored water (e.g., BGVN 32:01 and 30:11), erupted on the morning of 3 February 2010, sending a plume of ash and steam 100 m into the air (figure 7) and turning the surrounding ocean a yellow-green color (figure 8). Additional observations of discolored water have been frequently documented in JMA reports since November 2006 (BGVN 32:01). Figure 7. Aerial photograph of an ash plume rising from the ocean over Fukutoku-Okanoba on 3 February 2010. Photograph courtesy Japan Coast Guard. Figure 8. During a lull in the 3 February 2010 eruption of Fukutoku-Okanoba, some water above the summit bubbled and took on yellowish-green colors. Aerial photograph courtesy Japan Coast Guard. The February 2010 eruption was discovered at about 0745 by the Japan Coast Guard patrol boat Yashima on a routine survey. The crew first noticed "smoke" coming from the surface of the ocean ~ 5 km NNE of the island of Minami-Iwo-jima. The crew also heard a blast and felt its pressure wave. The Yashima continued to monitor the site from a safe distance. Satellite imagery provided evidence that the activity persisted for at least several days. On 9 February the underwater plume appears as a complex shape N of the volcano (figure 9). Two days later, on 11 February, the plume was spread W of the volcano (figure 10). Figure 9. On 9 February 2010, the Advanced Spaceborne Thermal Emission and Reflection Radiometer (ASTER) on NASA's Terra satellite captured this false-color image of the ocean around Fukutoku-Okanoba volcano. Water colored by the underwater plume appears lighter in contrast to the surrounding water. The discolored water initially formed a rough V-shape N of the summit. Courtesy of NASA Earth Observatory. Figure 10. Satellite image taken 11 February 2010 of the ocean around Fukutoku-Okanoba volcano. The water colored by the plume forms a V-shape W of the volcano summit. This true-color image (enhanced for publication) was taken by the Advanced Land Imager (ALI) on NASA's EO-1 satellite. Courtesy of NASA Earth Observatory. JMA isssued eruption alerts for 9 March and 8 April 2010. This suggests that the eruption continued into April. Information Contacts: Japan Meteorological Agency, 1-3-4 Otemachi, Chiyoda-ku, Tokyo 100-8122, Japan (URL: http://www.jma.go.jp/); NASA Earth Observatory (URL: http://earthobservatory.nasa.gov/). Fukutoku-Oka-no-ba is a submarine volcano located 5 km NE of the pyramidal island of Minami-Ioto. Water discoloration is frequently observed from the volcano, and several ephemeral islands have formed in the 20th century. The first of these formed Shin-Ioto ("New Sulfur Island") in 1904, and the most recent island was formed in 1986. The volcano is part of an elongated edifice with two major topographic highs trending NNW-SSE, and is a trachyandesitic volcano geochemically similar to Ioto. Sun C-H, Stern R J, 2001. Genesis of Mariana shoshonites: contribution of the subduction component. J. Geophys. Res, 106: 589-608. There is no Deformation History data available for Fukutoku-Oka-no-Ba. There is no Emissions History data available for Fukutoku-Oka-no-Ba. A 3-4 km eruption column above Fukutoku-Okanoba was seen from fishing boats on Janaury 18, 1986. A 4-km plume was detected by radar on the following day. On January 20 a new island was formed (seen here to the right of the eruption plume). 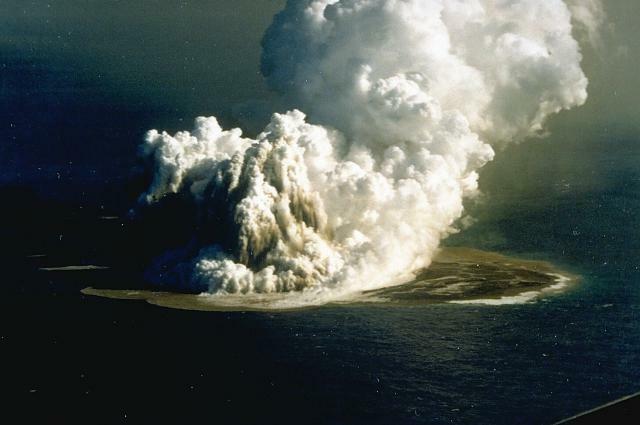 The island reached maximum dimensions of 600 x 400 m, with a height of 15 m. Frequent strong explosions continued on January 21, the day of this photo, and decreased in intensity that afternoon. Explosive activity ended by the next morning, and the island had disappeared by March 8. Photo by G. Iwashita, 1986 (Japan Meteorological Agency). A new island at the Fukutoku-Okanoba submarine volcano is seen on January 28, 1986. It was first seen on January 20, four days after fishing boats first observed an eruption plume rising from the sea. The island reached a maximum size of 600 x 400 m, with a height of 15 m. By January 22, explosive activity had ceased, and the island was completely eroded away by the sea by March 8. 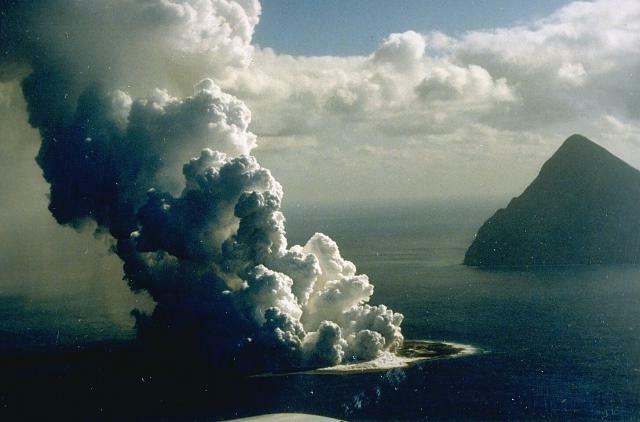 Fukutoku-Okanoba, seen here in eruption in 1986, is a submarine volcano located 5 km NE of the pyramidal island of Minami-Iwo-jima (right). Water discoloration is frequently observed near the volcano, and several ephemeral islands have formed in the 20th century. 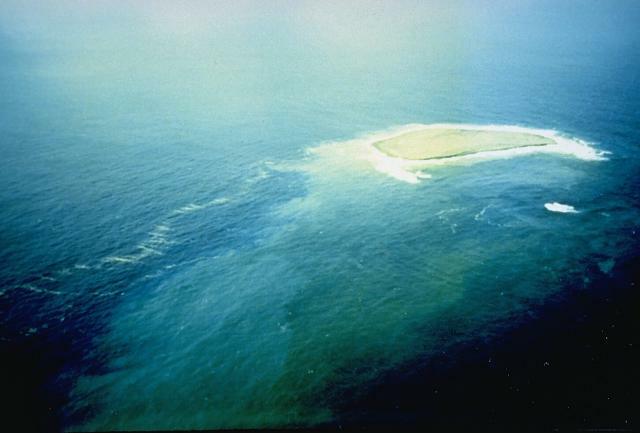 The first of these formed Shin-Iwo-jima in 1904, and the most recent island is seen in this January 21, 1986 photo. Wave erosion removed the island by March 8. Fukutoku-Okanoba is part of an elongated edifice with two major topographic highs trending NNW-SSE. The orange-colored topographic high at the top of this bathymetric image is Kita-Fukutokutai submarine volcano. This newly recognized submarine volcano lies halfway between Iwo-jima and Minami-Iwo-jima islands, NW of Fukutoku-Okanoba submarine volcano (center; north of Minami-Iwo-jima). Water discoloration was reported several times beginning in 1937 at Kita-Fukutokutai volcano. In 1988 a fishing boat reported an eruption column about 100 m high, although the report was not confirmed at the time. Image courtesy of HOD Japan Coast Guard (http://www1.kaiho.mlit.go.jp/jhd-E). An aerial view of Fukutoku-Okanoba taken on July 3, 2005 as seen from the NE shows a plume of debris and discoloration extending from the arrow. On the previous day a white plume was observed at Fukutoku-Okanoba, which later was observed to have reached ~ 1 km above the sea surface. Numerous large and steaming blocks were seen floating on the ocean surface at mid-day on July 3. The pyramidal island in the background is Shin-Iwo-jima. Photo courtesy of Japan Maritime Security and Safety Agency, 2005. Large Eruptions of Fukutoku-Oka-no-Ba Information about large Quaternary eruptions (VEI >= 4) is cataloged in the Large Magnitude Explosive Volcanic Eruptions (LaMEVE) database of the Volcano Global Risk Identification and Analysis Project (VOGRIPA).